At West Coast Marble & Granite, we are a stonework specialist having expertise not just in supplies of natural stone made benchtops, but also in Engineered Stone Kitchen Benchtops. To balance off the rising demand for these man-made ‘flavours of the decade’, we, the professional countertop supplier in Perth, showcase an extensive range, appearing in differing contemporary shades. Our repertoire includes every kind of engineered stone, starting from Caesarstone, Smartstone, Q stone, Silestone to Quantum Quartz Stone, helping us to earn an edge over our competitors. 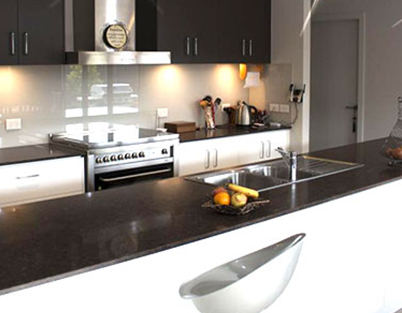 However, our replenished stock of Engineered Stone Kitchen Benchtops is not the only domain where we excel. As an installer, unsurpassed meticulousness is another factor, which has truly helped us earn a better reputation in the market. Nonetheless, if you are in a dilemma, finding it difficult to select between a natural stone made benchtop or that of an engineered one, then try the manmade version for a change. We promise you greater resiliency and improved resistance to stains, a well-known feature of these non-porous surfaces. As per pricing is concerned, we guarantee you the best deal so go ahead and place your orders. Let us transform it into an appealing set-up, without compromising on the hygiene factor.